Cancer Awareness Camp at International Hospital K'la. 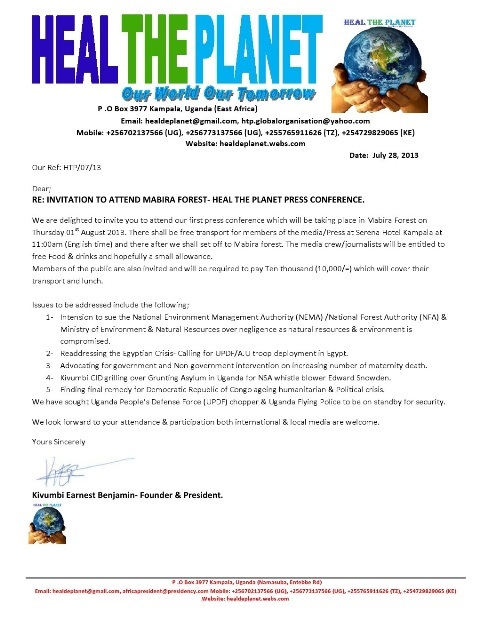 INVITATION TO ATTEND MABIRA FOREST- HEAL THE PLANET PRESS CONFERENCE. We are delighted to invite you to attend our first press conference which will be taking place in Mabira Forest on Thursday 01st August 2013. There shall be free transport for members of the media/Press at Serena Hotel Kampala at 11:00 am (English time) and there after we shall set off to Mabira forest. The media crew/journalists will be entitled to free Food & drinks and hopefully a small allowance. Members of the public are also invited and will be required to pay Ten thousand (10,000/=) which will cover their transport and lunch. 1- Intension to sue the National Environment Management Authority (NEMA) /National Forest Authority (NFA) & Ministry of Environment & Natural Resources over negligence as natural resources & environment is compromised. 2- Readdressing the Egyptian Crisis- Calling for UPDF/A.U troop deployment in Egypt. 3- Advocating for government and Non-government intervention on increasing number of maternity death. 4- Kivumbi CID grilling over Grunting Asylum in Uganda for NSA whistle blower Edward Snowden. 5- Finding final remedy for Democratic Republic of Congo ageing humanitarian & Political crisis. We have sought Uganda People’s Defense Force (UPDF) chopper & Uganda Flying Police to be on standby for security. We look forward to your attendance & participation both international & local media are welcome. 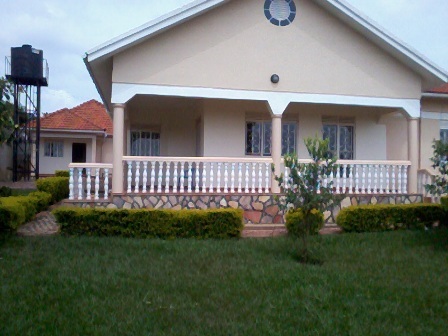 Kivumbi Earnest Benjamin- Founder & President. 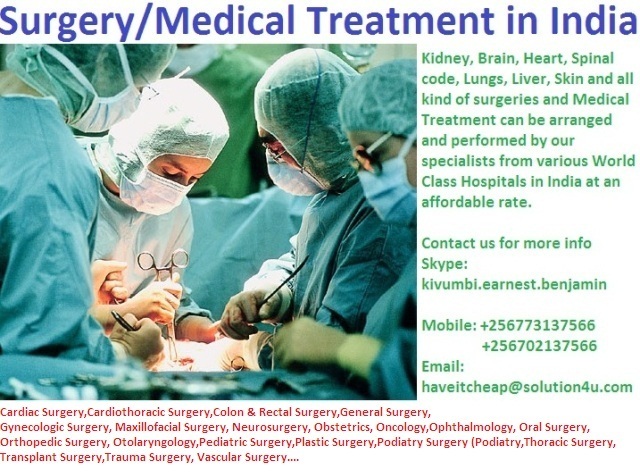 Super specialty consultations for patients suffering from Heart Diseases & Cancer. As a part of the Community Health festival, they will offer super specialty consultations for patients suffering from Heart Diseases & Cancer respectively. 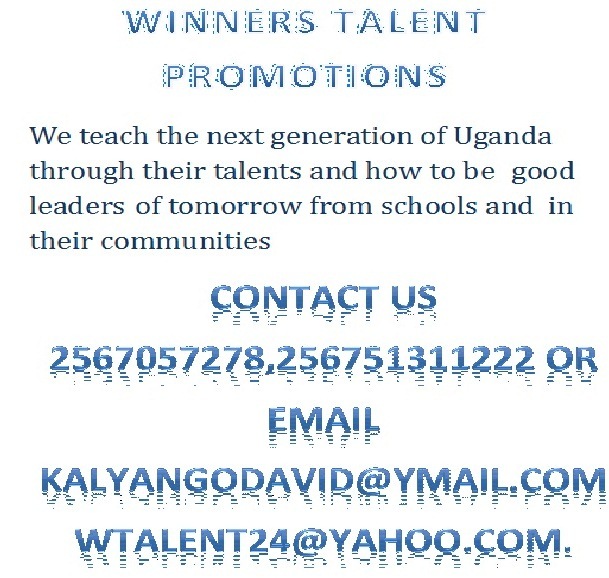 5 44 00 222, Appointments only on Friday 5th July at IHK Namuwongo. Dr Anil did his surgical oncology & specialized in minimal access surgeries in cancer from TATA MEMORIAL HOSPITAL. He has performed a few 1000s cancer surgeries and has numerous publications including 17 international publications to his credit. His cancer related expertise & areas of interests are Thoracic surgery like Lung Cancer, Mediastinal Tumors, breast cancer including breast preservation therapy, and minimal access (Laparoscopic) surgery for cancer. Hello My People, I have been Thinking of which Christmas Gift I can give to the World. 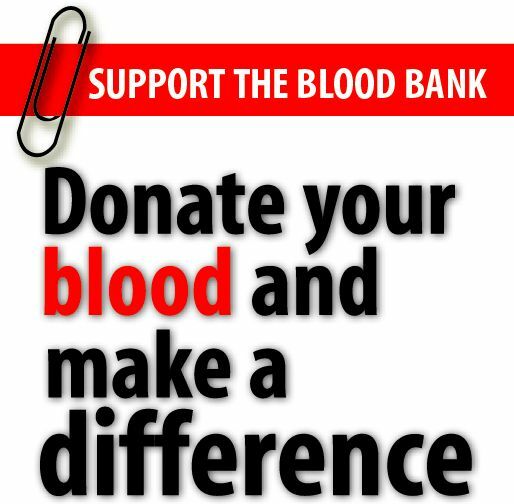 When I checked my Bank Account, I didn't see my much but when I checked my Blood I had more than enough. Please Accept my gift, its a life time heartfelt present and this is my first time to Donate Blood. Happy Christmas, May you Enter a year 2012 with as a better healthy and Wealthy Life and Do no forget to Thank God Always with every little or small things you get in life.